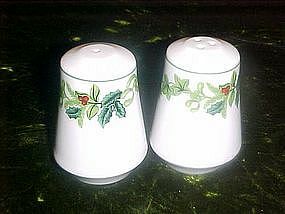 Nicely made porcelain salt and pepper shakers have a holly and berries pattern. Measures3" tall and has the originalrubber stoppers. Pristine condition. Perfect addition for your Christmas holiday table.